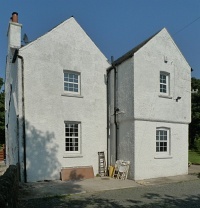 Honeyman, Keppie & Mackintosh made minor alterations and additions to this, the principal farmstead on Hugh Brown Collins' Auchenbothie estate. Authorship: Mackintosh signed the drawings approved by the county planning authority, and is named as architect in the authority's register of new buildings. Alternative names: East Auchenbothie, Auchenbothie Farm , Auchenbothie Mains Farm . 1: This is the final measurement of work carried out by the wright, James Grant. It may not be the full cost of all work undertaken for Collins at Auchenbothie Mains.